This is no mirage. The Sahara is a the perfect five seater spa with all the features including hydrotherapy and aromatherapy. Stylish, sleek, modern. That’s the Paris 3 with its blade waterfall cascading from a black granite bench, it is simply unique. Limited by space but still want all the benefits of a large spa? Look no further than the Sorrento 3. Immerse yourself in the sensory experience of side by side Reclining Lounges, Fibre Optic mood lighting, soothing waterfalls, and 51 jets. Add on a music system to take it to the next level.. The Balcony: Compact in size but not in nature, The Balcony boasts all the features of our larger spas, yet it has been designed small & light enough to fit on a balcony. Smooth lines. Power efficient. Compact in size. No fuss. That is your own personal Oasis. Wow! Simplicity meets features. The simplicity of a small spa for 2 or 3 people with the features to soothe your senses and your wallet. Byron Bay is a compact 5 seat spa featuring 2 reclining lounges, Fibre Optic lighting and 3 Roman Fountains for the ultimate in relaxation together with Hydrotherapy Jets to take care of those annoying aches and pains. With all of these features you cannot help but de-stress. Entertaining is your thing and short on space: the Miami Beach is the spa for you! Six dedicated seats, 24 Fibre Optic Lights both inside & outside the spa all colour co-ordinated and easy to look after, the Miami Beach is a winner. Moana Beach is a modern day version of the old Hot Tub. 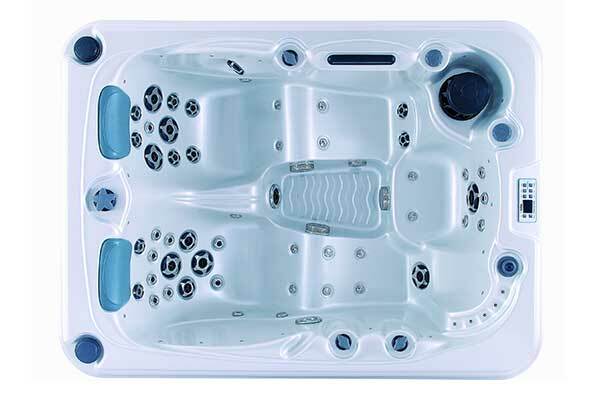 Un-moulded seating for 6 people with 3 height levels all facing each other it is a cosy, social spa, all with Hydrotherapy Jets for when you need them. A larger version of Moana Beach, Sunny Beach gives you a bit more room for feet & shoulders without losing any jets or features. Kick back & relax with your friends or family. You prefer a little more room to move and a little bit more layback, the Palm Beach will suit you perfectly. Ask to hear the music system and you will not be able to say no to this spa! The Venice boasts 2 waterfalls, 70 jets, 20 Fibre Optic Lights and a Child Seat which doubles as an internal step making it a breeze to get in and out. This spa features 2 Foot Lock Reclining Lounges, Reverse Moulded Neck Hydrotherapy Jets and Hydrotherapy Jets for your legs as well as your back. With all that massage going on you will be sure to sleep like a baby. Noosa Beach is great mid-size spa. With its compact rectangular shape, it suits hard to fit places & yet seats six people comfortably. A Hydrotherapy spa designed for those requiring or wanting an easy entry with internal steps. It also boasts a comfy armchair raised higher for those who do not bend so well at the hips & knees. Surprisingly the Kirra Beach has retained all the features not usually associated with a therapy item such as curved lines and Fibre Optic Lighting Package. Who said practical can’t also be pretty, not Summer Spas!